Indianapolis, IN (April 2016) This announcement gives a whole new meaning to the fond nickname ‘Minnie Winnie.’ GreenLight Collectibles, a leader in scale models and collectibles, is excited to announce their newest licensing agreement. 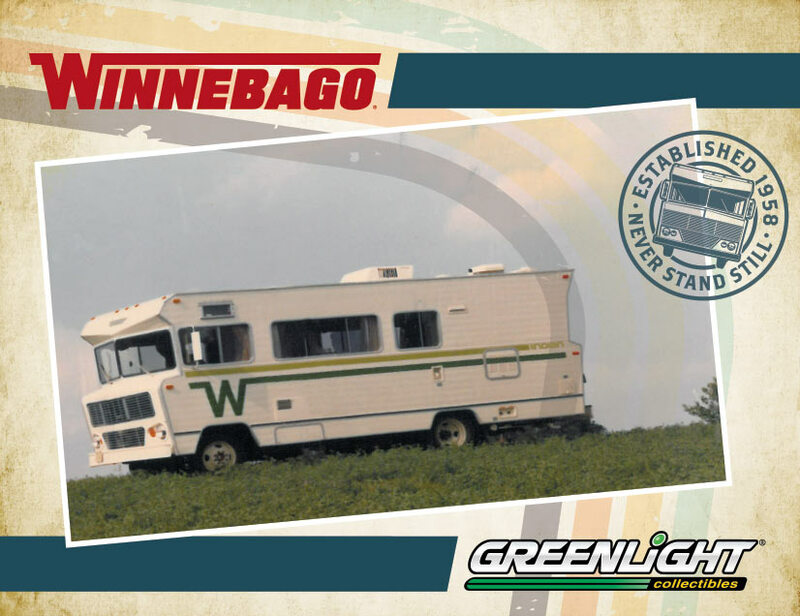 GreenLight will be partnering with Winnebago, the most recognized name in RVs, campers and trailer manufacturing. With GreenLight’s growth in the trailer and camper scale model market, this agreement comes at a very opportune time. This is sure to excite both scale model fans and Winnebago enthusiasts alike. The multiple year agreement covers a variety of scales and models to ensure a broad range of collectibles will be available. Jackson Clifton, GreenLight Wholesale Account Manager can’t wait to get these items out to the market. “When people talk about the RV market, everyone knows and loves Winnebago. I know our customers are going to flip when they see how great these models will be.” Development of the first stage of items is ongoing now. There will be regular announcements over the next few months across GreenLight dealer communication and social media of what and when to expect the first miniature Winnebagos. Winnebago, “The Most Recognized Name in Motorhomes®,” is a leading U.S. manufacturer of recreational vehicles, which are used primarily in leisure travel and outdoor activities. The Company and its subsidiary build quality motorhomes, travel trailers, fifth wheel products and transit buses under the Winnebago, Itasca, Winnebago Touring Coach, SunnyBrook and Metro brand names. The Company’s common stock is listed on the NYSE and Chicago Stock Exchanges and traded under the symbol WGO. Options for the Company’s common stock are traded on the Chicago Board Options Exchange. For access to Winnebago Industries’ investor relations material or to add your name to an automatic email list for Company news releases, visit www.wgo.net/investor.